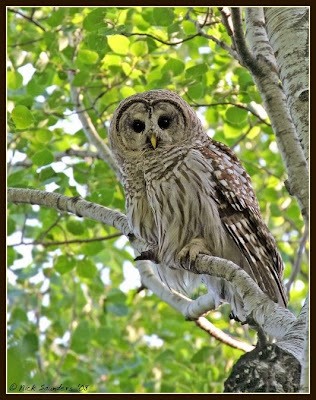 While it is quiet, I thought I'd post another shot of the beautiful Barred Owl I found at Little Amyot Lake this summer. Oh man...that is awesome! I've been hoping to see an owl but no luck. Thanks for posting that beauty! Glad you like him. It was such a treat to find one on my early morning walk at the lake. Wow! I wish I would see an owl - only twice, in all this birding! This one is great! I'm with birdlady, I'd love to see an owl during the day. The few I've seen have been at dusk and they're usually flying. I would frame this shot of this owl beauty! I have yet to see an owl in the wild in my life....still searching...and hoping. He's beautiful Nick. They always look like such old souls to me. Fantastic shot! He's kinda out in the open too--Lucky you! He's gorgeous!